Summary: Peel in any direction! Up, down, back and forth. Cuts prep time in half! * 2 Julienne Blades for perfect julienne slices of your favorite vegetables every time. 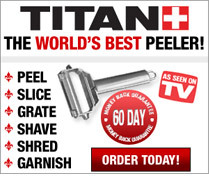 * 2 Slicing Boards that turn the Titan Peeler into the perfect slicer. * 2 Garnishing Books with tips and tricks on preparing fruits and vegetables.